Acquisition History: The New Hampshire Fish and Game Department purchased the Upper Ammonosuc WMA in 2014 with funding by the U.S. 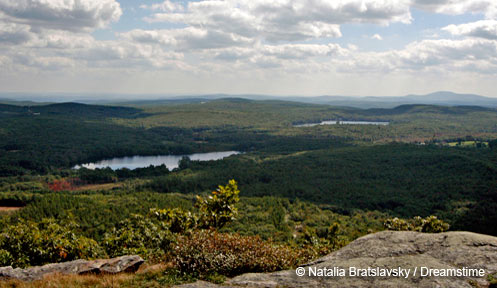 Fish and Wildlife Service’s Wildlife Restoration Program, a grant from the Upper Connecticut River Mitigation and Enhancement Fund, and funding from NHFG’s Wildlife Habitat Conservation fund. The property was purchased to ensure its permanent protection and to ensure it remains open to the public for hunting, fishing, and other wildlife related activities. Description: The property lies along a meandering portion of the Upper Ammonoosuc River and contains a number of oxbow lakes in various stages of succession. The property is dominated by silver-maple floodplain forest which provides excellent shrub habitat. A 4.5 acre old field provides additional diversity. The property is separated from the White Mountain National Forest by Route 110. Common Wildlife: The silver-maple floodplain forest provides excellent habitat for migratory birds such as veery, yellow warbler, warbling vireo, yellow-throated vireo, and northern oriole. Riverine floodplain forests provide important habitat for river otter, mink, muskrat, and beaver. The oxbow lakes may provide important breeding areas for several species of amphibians. Upland species include deer, black bear, turkey, snowshoe hare, and woodcock. Directions: From the junction of Routes 3 and 110 in Groveton, take Route 110 East for 11 miles and take a left onto Paris Road. In 0.3 miles, take a right onto Woodbury Cole Road. Park at a small parking area on the right and follow the foot path to the WMA.